Skerries had a deserved 23-17 victory away to Bective Rangers on the All Weather surface in Donnybrook. This was a vital match for both sides on the back of Skerries’s victory against the same opposition prior to Christmas. This young Skerries team is maturing every week and all 20 players played with real pride over the long 80 minutes. As usual there was a large travelling support for the team who had many anxious moments right up to the end of the match. Skerries started very well and after a strong run by Ross Dempsey, Eddie O’Mahony making a welcome return to the first team, scored in the corner. The difficult conversion was missed and after 6 minutes Skerries lead 5-0. On 10 minutes Skerries had a player sin binned and Bective, after a sustained period of pressure, scored a converted try to lead 7-5 after 14 minutes. On the return of the sin binned player Skerries had a period of possession and Paul O’Loghlen kicked a penalty after a Bective player was penalised for not rolling away after a tackle. Skerries now led 8-7 after 20 minutes.Skerries lost one of their talisman, Evan Sherlock, after 24 minutes with a knee injury and after 34 minutes Paul O’Loghlen had to be replaced, both replacements Thomas O’Hare and Billy Mulcahy made huge contribution to the team. After 35 and 38 minutes both Tom Mulvany and Thomas O’Hare looked like they would score but huge scramble defence kept Skerries out. Right on the stroke of half-time after a period of Skerries pressure Eddie O’Mahony scored again in the corner to make half time score 13-7 in favour of the away team. Skerries were rocked immediately after half time when Bective scored a well worked try which was converted and after 42 minutes Bective led 14-13. On 43 minutes Colin Doyle retired injured and was replaced by Lorcan Jones. After 44 minutes Mark Oliver appeared to score a try but after consultation between the referee and the touch judge, the ball was adjudged to have gone forward. Skerries then made changes with Kieran Leonard and Conor Ronyane both coming on to the field. After 62 minutes Bective were penalised for killing the ball on the ground and Billy Mulcahy converted the penalty to increase Skerries lead to 23-14. Skerries looked if now they could secure a win but Bective had other ideas and a penalty on 68 minutes left the score at 23-17. We then proceeded to have the most frenetic 10 minutes of rugby seen for a long time. Skerries has two players sin binned on 72 minutes and 76 minutes and managed to hold out Bective who had sustained pressure on the Skerries line. Skerries won a Bective lineout with only 13 men on the field. We then had a 2 minute period of high kicking and excellent aerials skills from both sides but Skerries held on for a brave victory. Many of the Skerries players had outstanding matches, led as normal by captain Ross McAuley,Marrey ,Tonge and the evergreen Nally all played key roles in the success. Tom Mulvany was outstanding, particularly playing without his injured normal partner Joe Glennon, Michael Turvey brought the ball forward at every opportunity and the rest of the forwards, The Sherlock brothers, Thomas O’Hare, Kieran Leonard and Conor Ronyane all played key roles. It was in the backs that the game’s outstanding player featured, after a long absence through injury, Ross Dempsey made a huge impact on his return both offensively and with some bone crunching tackles in defence. Eoghan Carron caused constant concern for the opposing number 9. 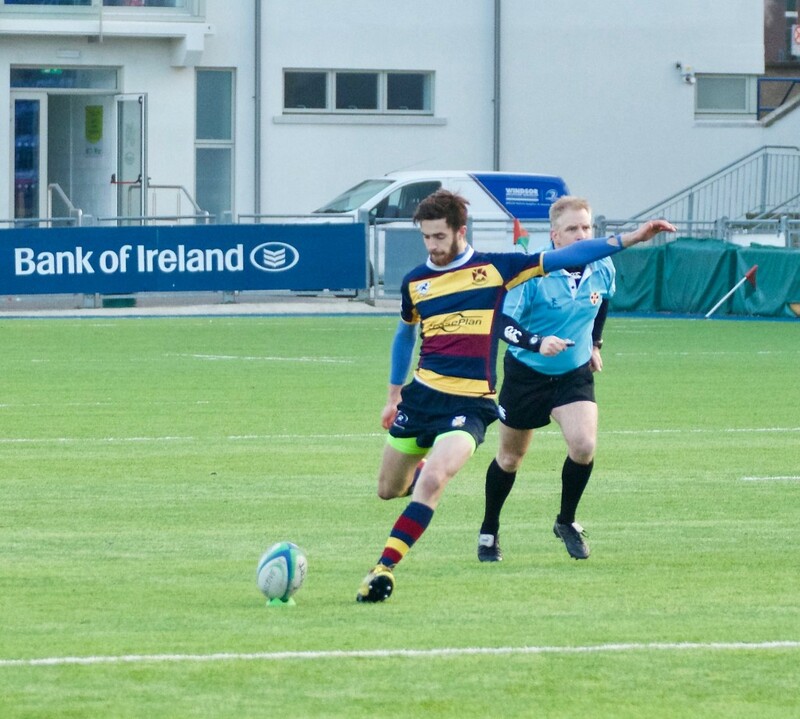 The returning Eddie O’Mahony also made a massive contribution .The young backs Mulcahy, Jones and Oliver were ably assisted by Doyle, O’Loghlen and Maurice McAuley in a huge team performance. This well may be a defining moment for this young team, with a strong scrum, good lineout and a backline that is now starting to click into top gear, 2017 is looking bright. We now have another big match next Friday night when Skerries play Wanderers, who defeated the league leaders Armagh at the weekend. A big crowd will be expected to support the team Skerries Team and Replacements. 15.Maurice McAuley 14.Eddie O’Mahony 13 Colin Doyle 12.Ross Dempsey 11.Mark Oliver 10 Paul O’Loghlen 9.Eoghan Carron 8.Ross McAuley © 7.Michael Turvey 6.Evan Sherlock 5.Tom Mulvany 4.A.J.Sherlock 3.Cormac Marrey 2.Chris Tonge 1.Mark Nally 16.Kieran Leonard .